If you've never had an issue with mismatched socks or socks gone missing, then consider yourself lucky. For the rest of us, this is the quirkiest solution to such a problem....make the mismatching worse (better! 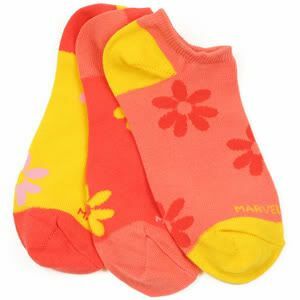 ), have fun with it, and end up with all sorts of socks. 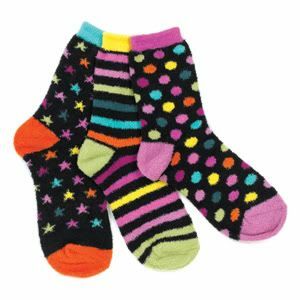 Little Miss Matched sells socks in sets of three...and the don't match exactly, but they complement each other. And if socks aren't your thing right now because it's summer, check out the flip flops instead. If you're zany enough to be okay with silly mismatching socks...that somehow match anyway....then definitely check these guys out. They have soooo many different kinds of socks, flip flops, cami sets, bedding, accessories (notebooks, purses, silly sock coin purses, etc), and surprisingly enough, a lot more stuff. They're nice. It certainly solves the problem! 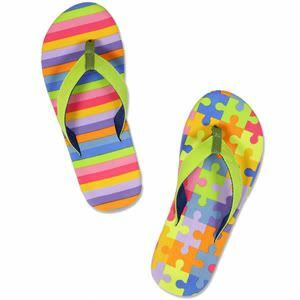 Yes, the flip flops come in pairs, but in the same wacky patterns, hehe. Oh, and since I wrote this a couple weeks ago, I actually ordered from them. They have *amazing* deals and clearances going on still, and everything shipped quickly. Even their boxes are mismatched and quirky, hehe. I would so much like to order from them but they only post to the US. Regardless, love it! It's funny how people react when they do a double take at it like my bf who looked at my socks gave me a strange "For real?" look. He was totally just jealous. I don't know where all they deliver to, but I know they also ship to Canada for sure. The only reason I know this is because the shipping rates were apparently outrageous to ship to Canada, so I let a friend ship their order to me and then I shipped it on to them because it still ended up being cheaper that way. Plus, it gave me a good excuse to ship them a few other things while I was at it. I didn't realize any of their stuff was carried at B&N! I wonder where else their products are carried. My girls love these socks and have umpteen million sets. I think that's how I'm going to end up, Jen. I love these, hehe.